It was Remembrance Sunday 1987 at the cenotaph in Enniskillen, the county town of County Fermanagh, when the IRA exploded a bomb without warning, causing the highest death toll in a terrorist attack in Northern Ireland for five years. The bombing was co-ordinated by three IRA units and the bomb was put against the gable wall inside the town’s Reading Rooms. Eleven Protestants were killed — Bertha Armstrong, 53, Edward Armstrong, an off-duty member of the Royal Ulster Constabulary, Wesley Armstrong, 62, Samuel Gault, 49, Jessie Johnston, 66, Kit Johnston, 70, John Megaw, 68, Agnes Mullan, 70, William Mullan, 72, Georgina Quinton, 72, and a nurse, Marie Wilson, 20. Sixty-three people, including 13 children, were injured in the atrocity, among them Ronnie Hill, the former headmaster of Enniskillen High School, who remained in a coma until his death on 28 December 2000. 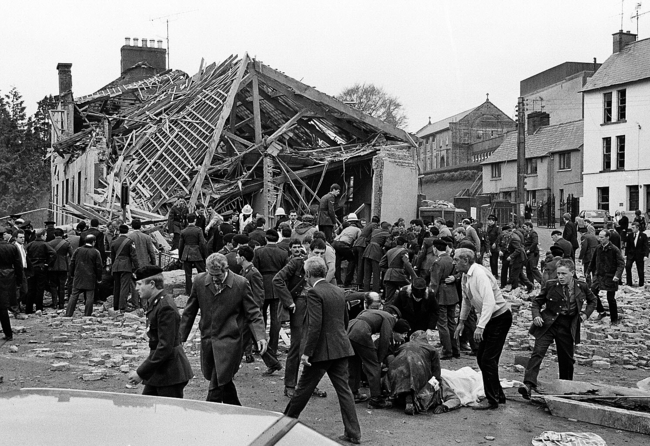 The bombing was regarded by many as tipping point in the Troubles, turning what little public support there was against the IRA. Tom King, the Secretary of State for Northern Ireland, denounced the bombing in the House of Commons and his Irish counterparts, Brian Lenihan in Dail Eireann and Senator Maurice Manning, spoke of their revulsion. Gordon Wilson, father of victim Marie, became a peace campaigner. He said, “I bear no ill will. Dirty sort of talk is not going to bring her back to life. She was a great wee lassie.” On Remembrance Day 1997, Gerry Adams, the leader of Sinn Fein, formally apologized for the bombing. The site of the bombing was rebuilt as a youth hostel, which was opened by President Bill Clinton in 2002.